PG&E crews remove power lines damaged by fire off Bille Road in Paradise, Calif., on Saturday, Nov. 10, 2018. Embattled PG&E is reportedly nearing a deal to overhaul its executive team. PG&E is the state’s biggest investor-owned utility, with 16 million customers across a 70,000-square-mile service area in Central and Northern California. It faces at least $30 billion in potential liabilities from California wildfires in 2017 and 2018. Many of those were allegedly started by the company’s equipment, which caught the attention of state officials who question the safety of PG&E’s electric system. The company’s share price plunged after announcing plans to pursue Chapter 11 bankruptcy in January. The stock closed about 2 percent lower on Tuesday. Shares are down more than 59 percent year over year. 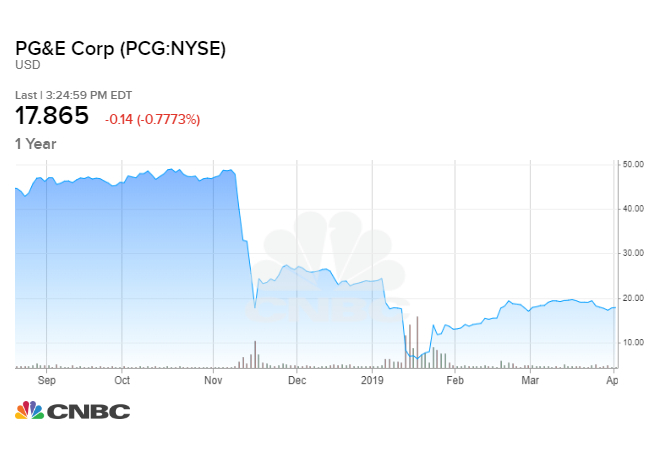 According to a February Wall Street Journal report, PG&E delayed safety work on a century-old high-voltage transmission line that is suspected to have caused the deadliest wildfire in California’s history. Earlier this week, Bloomberg reported that the stakeholders are proposing a $35 billion plan for the company to emerge from bankruptcy within a year. — CNBC’s Thomas Franck contributed reporting.